Longford got back to winning ways in CPL Park with a hard fought victory against De La Salle Palmerstown (DLSP) today. After the first seven games of the season Longford were flying high at the top of the league but had hit a somewhat of sticky patch of late having lost out in three of the last four league games. However, Longford knew that a win today would keep up the pressure on second placed Monkstown in the battle for second and a shot at promotion via a playoff. DLSP started off the match the better of two teams. They looked a different side to the one that Longford had played in Kilternan early in the season where they were good going forward but somewhat less secure in defence. They were a lot more solid and aggressive in defence with attack more based on hard carries and offloads in the tackle then backline endeavour. After early Longford possession DLSP made good progression up the pitch and after a few carries their No. 8 received an inside pop pass and ghosted in under the posts for a converted try to leave Longford chasing the game. DLSP kept Longford pinned back for the next few minutes following the try but as has been their want this season, Longford seemed to be shocked into action by the opposition notching up some points and came at DLSP hard from therein. It took just over ten minutes for Longford to reply to the DLSP score. Like the away sides early score, Longford worked their way up the pitch and then laid siege to the DLSP line with multiple hard carries and play from side to side. Eventually, the pressure told with Out-Half Ian McCormack crashing over under the posts for a converted try to level up the scores. The rest of the half was pretty even with both sides threatening at times. It boiled over on one or two occasions with both the Longford No.7 and DLSP No.8 shown the yellow card for off the ball handbags just before half time. Like the previous match Longford were again enjoying dominance in the scrum. So, it was all to play for in the second half with Longford having the benefit of the wind. Longford put in a far more controlled second half performance, with great carrying from the pack a feature. Indeed, they will have been disappointed not to have added a few more tries when they were in DLSPs 22. Alas the final pass or decision was not the right one and this led to a tighter finish to the affair then supporters in CPL Park would have liked. Longford began to show their possession and territory on the scoreboard on the twelve and fifteen minute marks with two penalties via the boot of Ryan McHugh putting them 13-7 on front. However, disaster struck after twenty-three minutes when a Longford mistake was worked out to the DLSP wing. DLSP made good progress up the pitch and before long Longford found themselves 13-14 down. Longford knew there was plenty of time to still rescue the result and they came back at DLSP with gusto. One of the periods of pressure earned Longford a penalty, which was kicked into the corner. Barry Stewart gathered the dart and set up a driving maul with Dylan Quinny crashing over for a well worked try. This was followed up by a great touchline conversion from Ryan McHugh to put Longford six points to the better with seven minutes to play. Indeed, Longford can count themselves unlucky not to have tacked on one more try. The end of the match saw DLSP on the attack but the Longford defence held out and they emerged with a good victory to keep them the hunt for league honours and build momentum in the run up to next Sundays Provincial Towns Cup First Round at home to Cill Dara. Longford Squad: L Brady, P Dardis, D Quinn, A Hughes, B McManus, B Stewart, K O’Gorman, P Gallogly, N Farrell (C), I McCormack, S Farrell R McHugh, S Rodgers, C Seery, J Forde, D Farrell, B Hanley, D McHugh & J McGowan. Longford Early XV will have been disappointed to let a 14-05 half time lead slip to 17-19 full time loss, especially since they were playing into a strong wind in the first half. DLSP enjoyed some early pressure and missed a shot at goal before Longford began to play. Longford looked very dangerous out the backline with Sammy Murphy creating some good line breaks and distributing well out to the outside channels. DLSP had a number of big call carriers in their side and they were the ones that ultimately gave DLSP the platform for victory. Their first score came in the corner after some good carries and play down the wing. It was not converted. The rest of the first half belonged to Longford who scored two great tries, the first was from Podge O’Farrell who crashed over the line through his opposing number who bounced a few feet backwards! This put Longford into a 7-5 lead after thirty- three minutes. Longford kept up the pressure and after moving the ball wide Sammy Murphy broke through the home side defence and gave the final pass to Finbarr McGowan who raced up the line and then converted his own try to leave the half time score 14-05. Longford would have been confident of seeing out the match with the wind at their back in the second half. However, DLSP had other ideas and came at Longford with a lot of hard carries, which Longford found hard to contain. They went over for a try down the wing virtually from the kick off and then tacked on another score to go into a 14-19 lead after twenty minutes. Longford then came back into the game and brought the deficit back to two points via the boot of Finbarr McGowan with fifteen minutes to go. 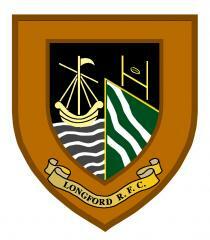 Unfortunately, try as Longford might, they could not add on another score and went down to a narrow 17-19 loss. They Early XVs next match is away to Tullow on Sunday week as they build up for their First Round of the Provincial Seconds Towns Cup away to Athy on February 4th. If the side continue to improve there is no reason why they can’t be eyeing a good cup run. Longford Squad: P Mimnagh, B Hanley, P O’Farrell, M Cullen, F Davis, D Corrigan, J Geelan, D O’Brien, R Shaw, D McHugh, J Mimnagh, S Murphy, S McGuinness, F McGowan, D Connolly, R McCormack, J Forde, M Casey, J Magan & K Murray. “Nice to get one win today, but if we are honest, as a group we wanted two. And I guess that’s a testament to where we have go to on this journey, that we put the expectation of winning on ourselves. DLSP came to play today in both games and we needed to be good to get two results, unfortunately we couldn’t do the business in the Early game, but we showed when we play to structure with this group, we can challenge good teams. And for the early group the graph continues to climb in what we are doing off the scoreboard. We are always saying none of what we are doing works unless we have real depth, internally we call the team our Backboners, a vital part of the group and that shows in what the Early group is doing, we are putting ourselves into game winning positions against quality opposition, and that is a big plus for the club. For the Late Team we needed to get a performance to match the win which we haven’t done for a while, and against a good well prepped DLSP we did pretty well. DLSP defended really well and attacked direct while varying their attack, which challenged us defensively. But we thought we reacted well to going behind twice, and then showed a good control to close out the game by managing our pitch geography pretty well. We still have a focus on the playoff spot in the league after a couple of disappointing results, and even though we are in third spot we still have an opportunity. But for both teams now we shift focus to the Towns Cup. The boys love this comp, and it excites them to be in it, so getting them up for it is pretty easy for us coaches. It’s a clean slate and a chance to have a go. They all want to be involved at some level so competition for places is full on.